It was Abraham Lincoln who said, "The best way to predict the future is to create it," and he followed that credo in his leadership style. Lincoln, like all great leaders, knew that the only way to create a new future was to make some major changes. The biggest challenge for leaders in these times of volatility and complexity is leading at the speed of change and staying ahead of the changes that need to happen to create a successful future of work. The first step of creating the future is creating a vision, and the second step is communicating the vision—often the vision part sits in the head of the CEO or the leadership team. I have heard many a CEO say, "My team doesn't get the vision," and typically that's because the CEO has a vivid idea in her or his head but have not articulated it in a meaningful way. This idea is where the communication piece is critical—a well-communicated vision has emotion, is visually appealing, and is easy to share. A passionate vision can lose steam if there aren't compelling visuals to support it; for example, supported by a dynamic 'story' that goes viral within the company. This vision—where change leadership comes in—the senior leadership team can have a vision, communicate the vision, and then expect everyone to do it and to execute with success. However, without a step-by-step change leadership plan to provide the 'why' and 'how' and focus on 'what's next', most change initiatives struggle and fail. In an ideal scenario, the entire change process for an organization is collaborative, measurable, and has clear milestone celebrations. Creating the future is mostly about engaging everyone to want to participate in making the changes needed to transform the business. 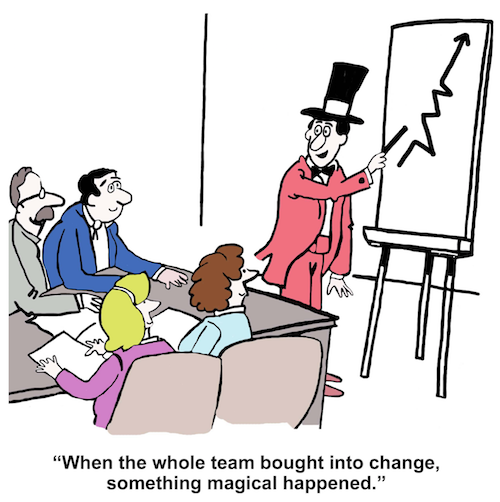 Let's face it: the biggest and most difficult change is the mindset of leaders and teams. In my book, "The Art of Change Leadership", I provide a change wheel as a self-assessment tool that allows leaders and teams to self-diagnose where she or he is on the 'mindset' aspect of change. If a leader or team member is on the optimistic and creative side of the wheel, then its likely that the change is being 'next mapped' powerfully and effectively. If a leader is a self-identified as being defensive and in fear of the changes it's also likely that change within the company is stalled, sabotaged, or failing. If you want to predict the future, you can predict it based on the mindsets and actions in place today. Cheryl Cran is a future-of-work expert and the founder of NextMapping.com, a future-of-work research and consulting firm that helps leaders, teams, and entrepreneurs be future-ready.